Mostly cloudy skies. High 58F. Winds NNE at 5 to 10 mph..
Ellen Finnigan has now earned the right to call herself an award-winning writer. 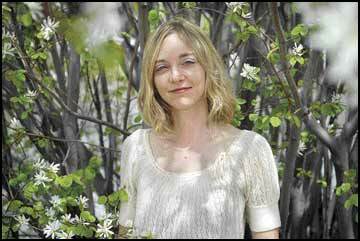 On the cusp of graduating from the University of Montana last week, Finnigan was celebrated as winner of the prestigious 2008 Merriam-Frontier Award for her contest submission of three nonfiction essays. "I was really excited to win it," Finnigan said. "It's a great tradition at the university and the program is full of really talented writers. It was an honor to be given this award." Along with the accolades and praise for her literary skills, Finnigan received $500 and will likely have her essays formally bound in a book printed by the University of Montana Press. "This is the first award I've received for my writing, and it's a big deal for me," said Finnigan, who also is the proud new owner of a UM master's degree in fine arts. "It's encouraging for me, and it will give me a boost as I continue working on my book." About 40 students entered this year's contest, representing a wide variety of academic majors, said Prageeta Sharma, director of UM's creative writing program. The annual contest is sponsored by the department of English and is open to all UM students. In past years, winning entries have included works of poetry, short stories and essays. The Merriam-Frontier Award was established by H.G. Merriam, who created UM's bachelor degree in creative writing in 1929 and was a UM professor of English and creative writing from 1919 to 1954. Named in honor of Merriam, the award also pays homage to "Frontier," a distinguished quarterly journal at UM from 1920 to 1939 that published the works of emerging new talent, including Wallace Stegner, A.B. Guthrie Jr., William Saroyan and Dorothy Johnson, Sharma said. Although the journal is no longer in print, the Merriam-Frontier Award continues to honor emerging talent. Frances Kuffel, a UM English major, was the first recipient of the award in 1982 for a volume of poems. Finnigan said she is honored to join the long list of award recipients, including that of Judy Blunt, Finnigan's mentor. Blunt won the award when she was a student in 1992, and now is a celebrated author and an associate professor of English at UM. The award was an extraordinary capstone to her amazing academic experience at UM, Finnigan said. "The creative writing program here has benefited me immensely and I have learned so much from every one of my professors," she said. "They taught me so much and took my writing to a whole new level I wouldn't have gotten to without their mentorship."